Why Homer Matters is a magical journey of discovery across wide stretches of the past, sewn together by Homer's poems and their metaphors of life and trouble. Adam Nicolson sees the Iliad and the Odyssey as the foundation myths of Greek—and our—consciousness, collapsing the passage of 4,000 years and making the distant past of the Mediterranean world as immediate to us as the events of our own time. 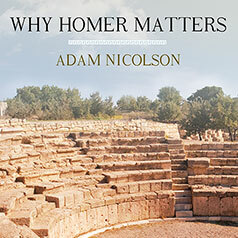 Homer's poems occupy, as Adam Nicolson writes "a third space" in the way we relate to the past: not as memory, which lasts no more than three generations, nor as the objective accounts of history, but as epic, invented after memory but before history, poetry which aims "to bind the wounds that time inflicts." The Homeric poems are among the oldest stories we have, drawing on deep roots in the Eurasian steppes beyond the Black Sea?. These poems, which ask the eternal questions about the individual and the community, honor and service, love and war, tell us how we became who we are.